Voter Girl Project - In collaboration with the Girl Scouts of Northwest Florida, the League of Women Voters of the Pensacola Bay Area, the Institute for Women in Politics, the Escambia Education Association, the Escambia Retired Teachers Association and the Florida Retired Teachers Association, is initiating a new program, The Voter Girl Project. This program will include teaching Girl Scouts at all levels from Daisies to Ambassadors about citizenship, voting and leadership. The program is in keeping with the mission of the League of Women Voters to encourage citizens to be knowledgeable and participate actively in government. Each scout will achieve a badge by meeting the qualification and performing the activities as spelled out for the particular level in the Girl Scout handbook. The League of Women Voters and others will provide expertise about voting, public policy and advocacy. School to Prison Pipeline series of videos found here. Pipeline to Prison - Workshops Continued... (#6) There was a 30 minute documentary called America Divided. The documentary is co-produced by Oprah Winfrey, Norman Lear and Shonda Rhimes. A panel discussion followed the documentary. The topic was children in adult court and adult prisons. Watch the Video of the forum by James Scaminaci III here. Where do used plastic bags go? Did you know 5 Trillion plastic bags are manufactured globally eah year? Fifty Billion are trashed. Only 1% are reycled.....The Natural Resources Committee is studying and exploring how we might reduce or even ban the use of single use plastic bags in our communities. Call Carolyn Kolb, 850-939-8653 or c.kkinfla at gmail.com for more information. 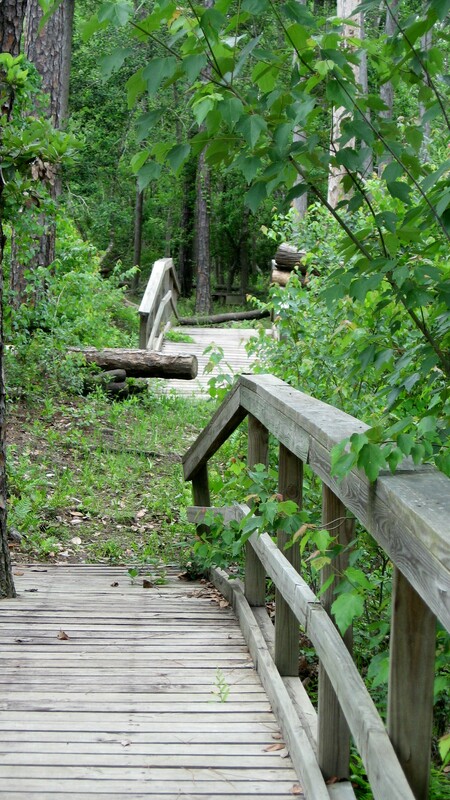 IVAN DID IT IN - In 1998, the LWVPBA received two grants totaling approximately $3,000 from the LWV Education Fund to construct a Nature Trail at The Perdido River Walk, an Escambia County park behind of the land fill on Beulah Road. Members and friends bought boards so bridges could be built and gave generously to become a FRIENDS of the Perdido River Walk. Twenty-five wooden posts marked spots botanists determined to be ecologically significant. Tour brochures were designed for use with numbered markers and brochures indicating the flowers, birds and animals which could be observed along the walk. Additionally, the grant provided money for the production of wetland packets and a video cassette which were distributed to all middle and high schools in Escambia and Santa Rosa counties as well as Escambia County, Alabama. Ivan's Destruction After hurricane Ivan the walking trail was very rough. In some areas it was difficult to find the correct path. All the bridges were in good condition, however, weeds and small trees grew between the boards. Only a few of the brass plaques individuals purchased, in support on the project, remained. Few of more than two dozen posts, indicating interesting spots along the trail, were standing. One wonders what ecologically significant area was hiding beneath fallen debris. The League's endeavor at the River Walk was taken by the wind. Thanks to the help of volunteers, the Riverwalk is largely restored. The trail is clear of debris and most of the signage posts have been replaced. A new welcome sign marks the start of the walk and a box containing brochures is to its left. All the brass plaques are secured to the bridges. There are comfortable benches along the way to rest and enjoy the scenery. 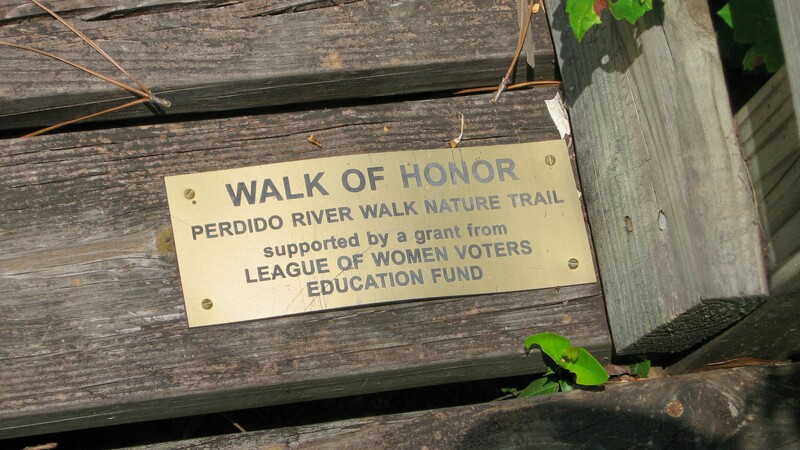 Our League invites you to come enjoy the serenity of Perdido Riverwalk.